Welcome to Day 2 of our hop! Today you're off to visit the following blog - just one today! Make sure you leave a nice comment on every blog you visit in the hop as it makes you eligible to win a prize! Thanks for hopping with us. Good luck! Welcome to Day 1 of our hop! Today you're off to visit the following blogs. 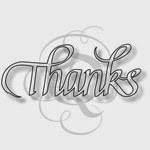 Make sure you leave a nice comment on each of their blogs because they do incredible work! It also makes you eligible to win a prize! I'm so excited. I have no idea what they've made! 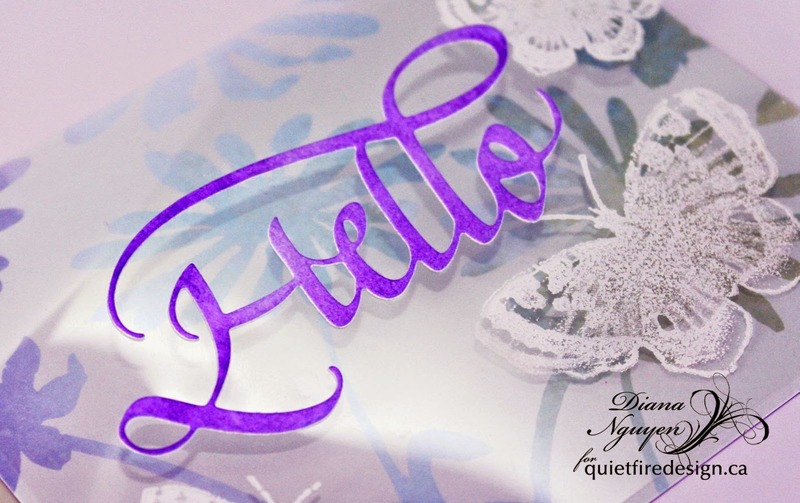 Welcome to the Quietfire Design Die-ing for Spring Blog Hop. Although the hop officially begins tomorrow, we just wanted to share the blogs you're going to be visiting this week. 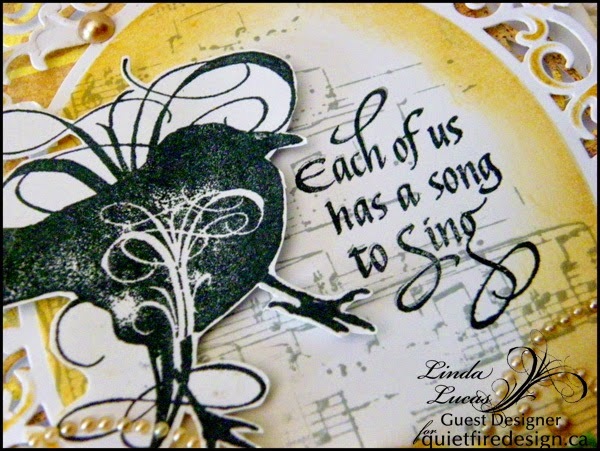 Hi, it is Linda here and I am excited to be back for my second post as the March Guest Designer for Quietfire Design - I love the sentiment I have used on today's card - my beautiful Nana insisted that everyone could sing - and she is right, but some voices have a rougher passage out! Just makes me smile! The Crows, set of 9 stamps set has so much potential. 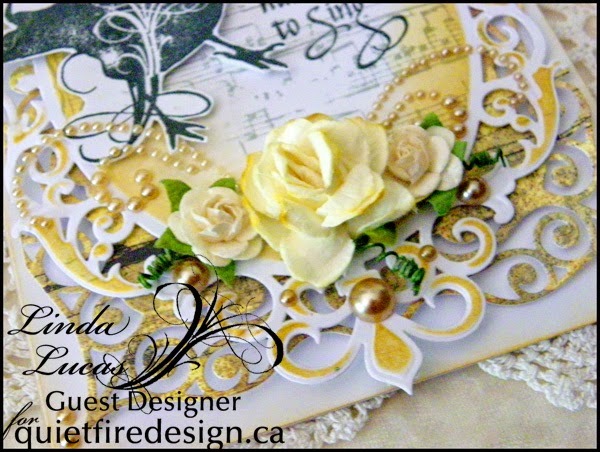 I started by lightly stamping the music sheet onto the Fleur De Elegance die, then using the Die as a Stencil and sponging the inside of the Die with Golden Glitz and a sponge dauber. The bird has also been stamped using Memento Tuxedo Black, then cut out by hand/fussy cut and popped up onto 3D Foam Squares. 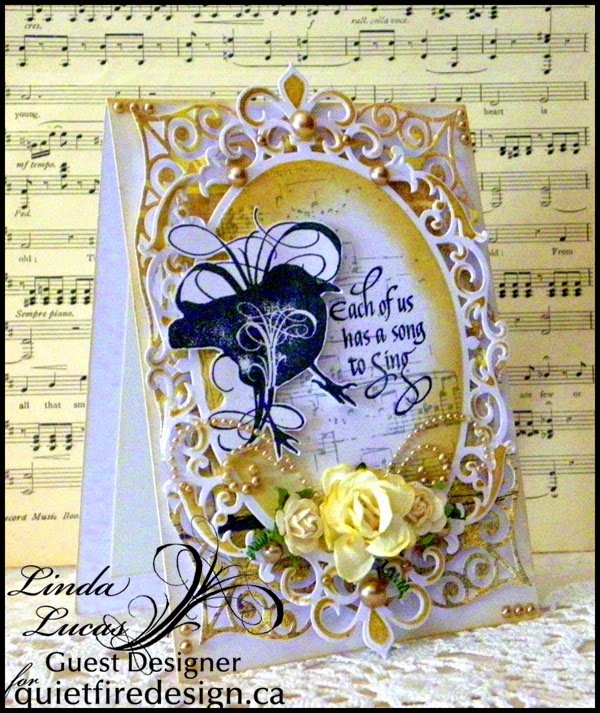 The sentiment has been stamped using Memento Tuxedo Black Ink and cut out using the Classic Oval Die, the inside of the Die has been sponged using Delicata in Glistening Gold. This has then been layered onto a Fleur De Elegance in white, using Crafty Foam Tape for dimension, followed by Labels Forty Decorative Accents, also popped up onto Crafty Foam Tape. The completed layers have been adhered to the card base using double sided tape. 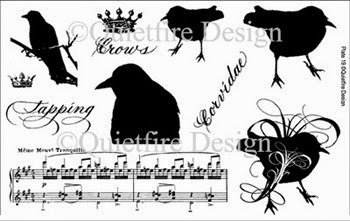 Quietfire Designs: Each of Us Has a Song sentiment and Crows, set of 9 stamps set. 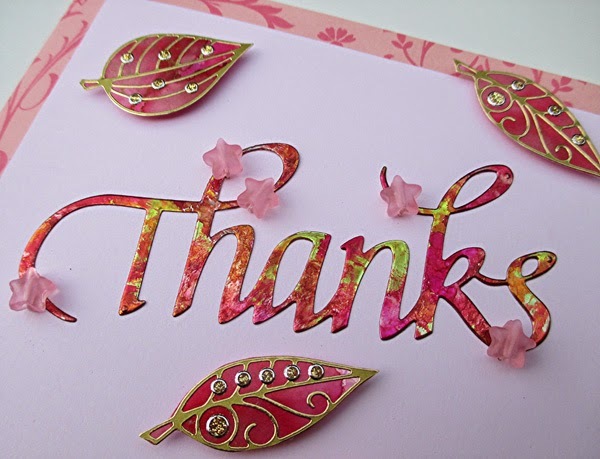 Thank you so much for having me and all of the encouraging comments you have left me - it has been a fabulous privilege being a Guest Designer - I hope you have been inspired in some way! 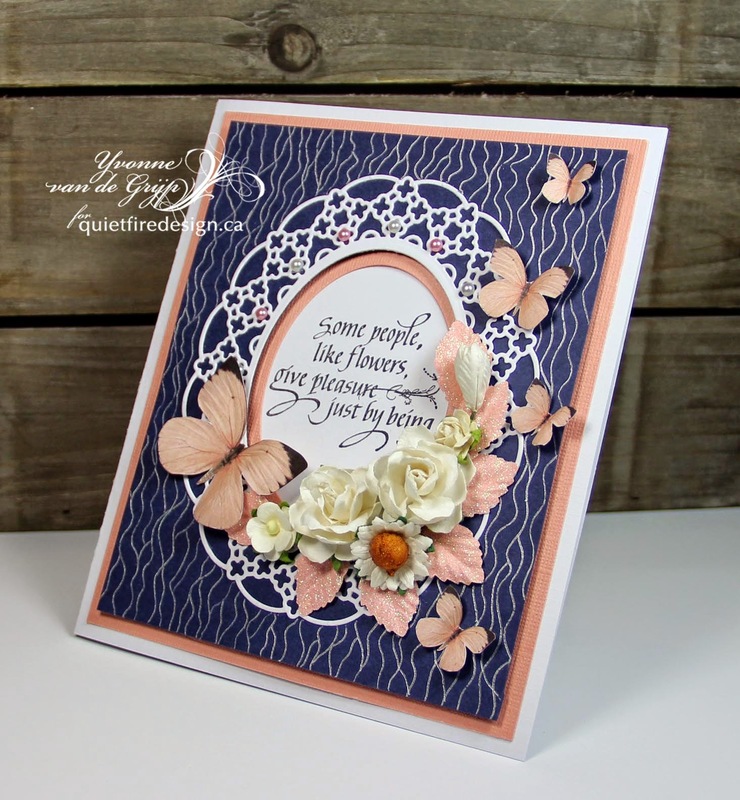 Yvonne here today with a spring inspired card using the Quietfire Design stampset "Garden Delights". I love this season...the squirls hopping around in our garden and birds flying around, searching for a place to build their nests soon. For my card I kind a created my own design paper by drawing silver lines onto dark blue cardstock. The butterflies were cut out of some designaper I had. Hi! 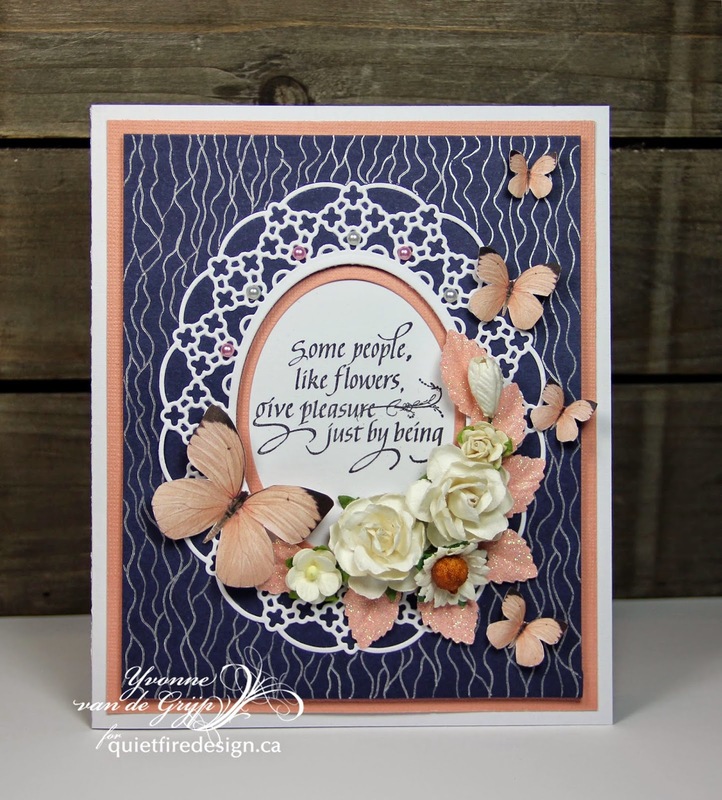 I'm so excited about Quietfire's new metal dies that I have two cards to share with you today. They both use the Hello die and they were both hard to photograph, especially the first one. I used Staz-On Opaque White ink. 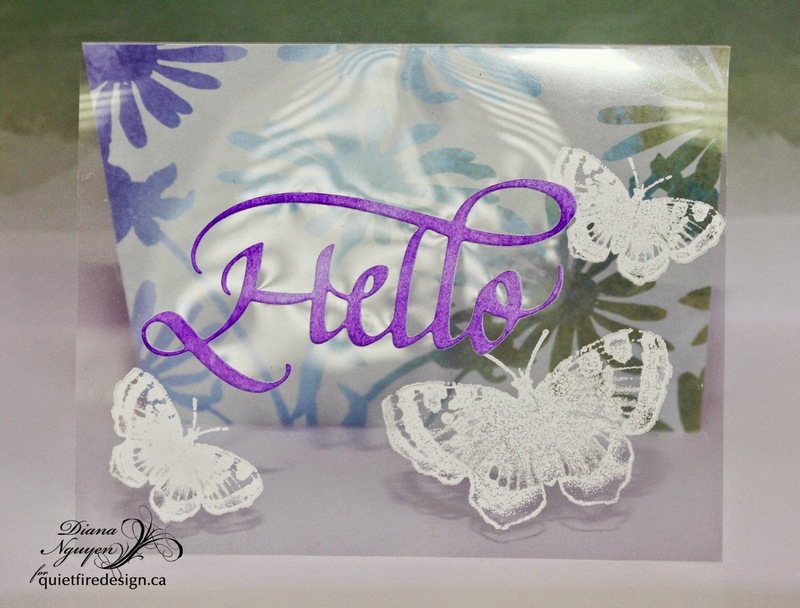 to stamp my butterflies on the clear acetate. I made a purple watercolor wash and then used the Hello die to cut out the watercolor paper. I then used just a thin strip of 1/8" Scortape to adhere my background paper to the back layer of the card. That way you could still lift up the back to write your note if you didn't want to write across the floral paper. So much glare but it looks quite neat and dainty in real life. On my second card I made a shaker card though it started out just as a negative die cut. But after adding the acetate to adhere the little inside pieces, I went ahead and added some beads and sequins. 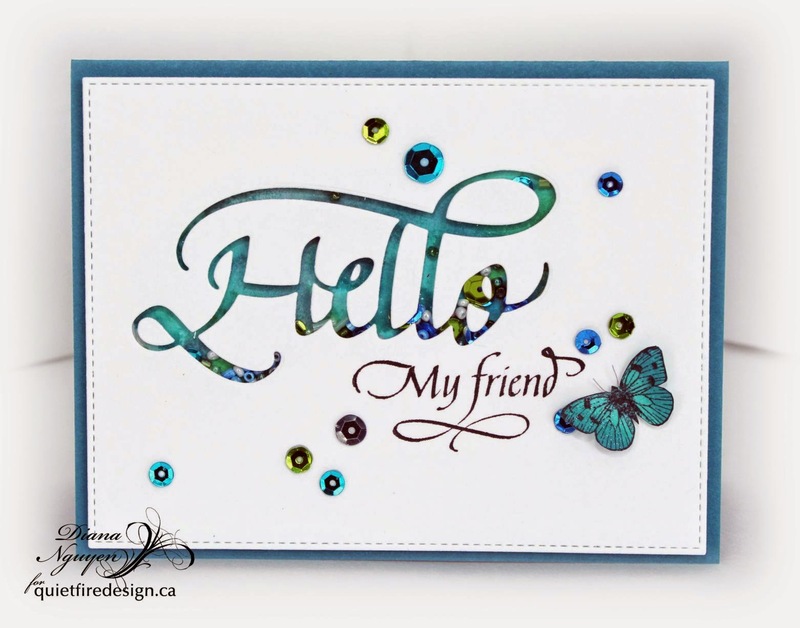 I also stamped "My friend" below the die opening and added some sequins to the front. of my favorite stamps called Wheresoever you go. 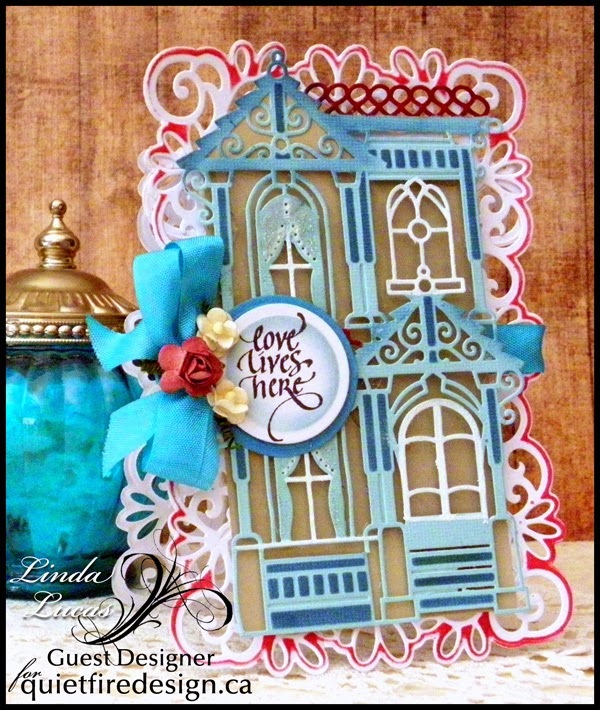 in the die set (S6-016 Heirloom Rectangle) made it easy to cut and overlap them to create this window in the card and to stamp and emboss the image for the inside of it. 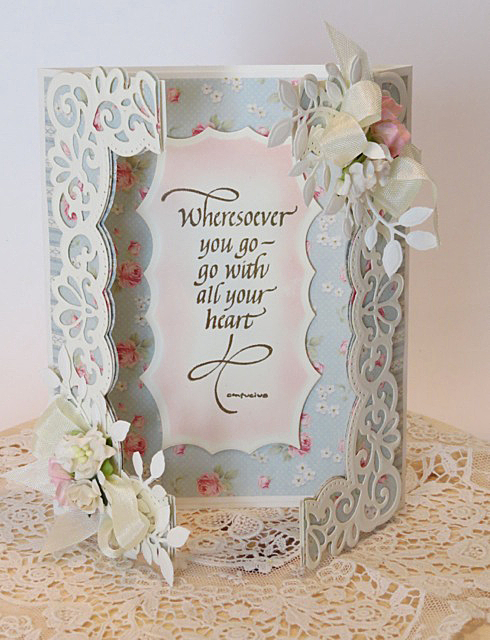 and cut the rose paper to create a layer underneath the lacy border. And then i cut it in half and adhered it to the card with 3D foam dots. in vintage sepia and added just a touch of ink around the edges with chalk ink. be sure and leave a comment and let me know what you think. Happy Monday, All! 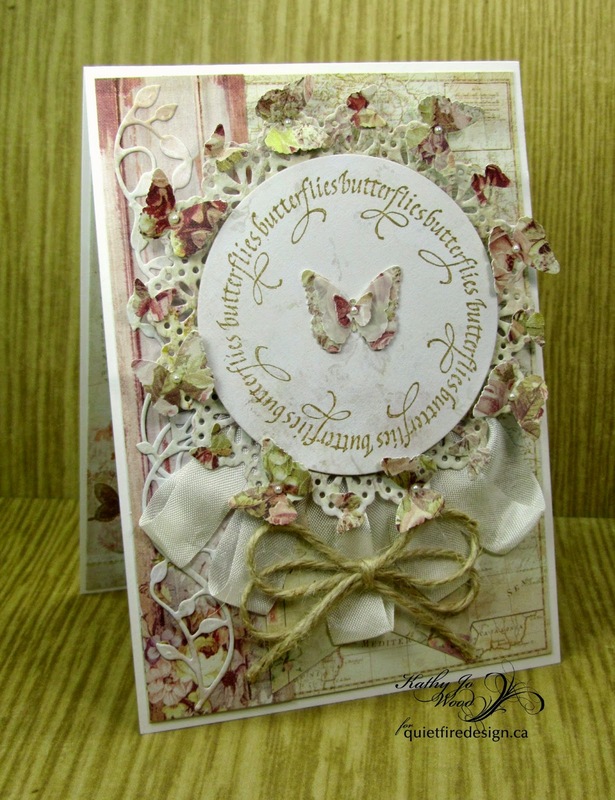 Kathy Jo here sharing a butterfly card using stamps from two different Quietfire sets. Yes, spring is supposed to be here which means that flowers will be in bloom and butterflies will flutter by soon. 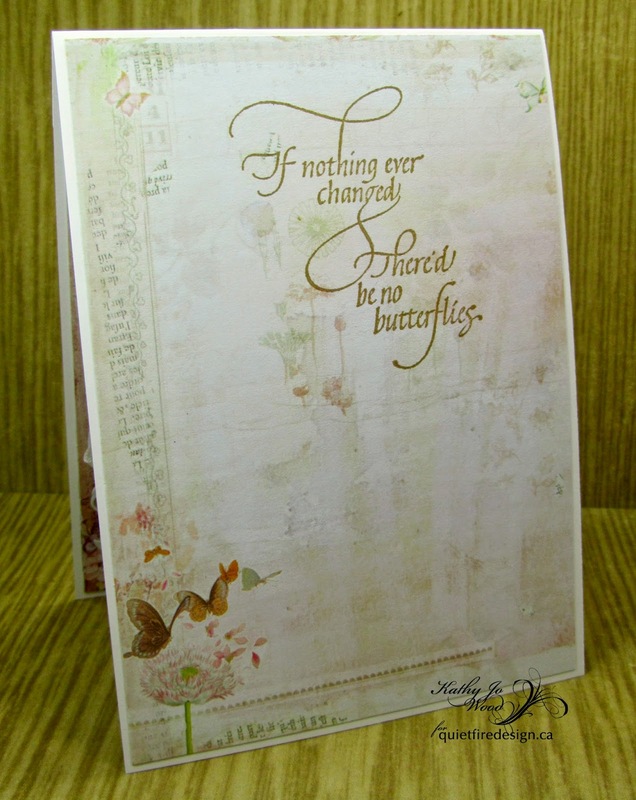 It was stamped on Prima's Butterfly paper and die cut using Spellbinders circle die. 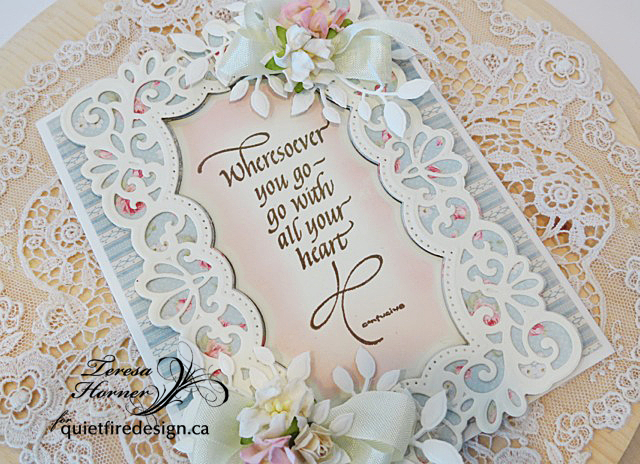 It was then layered on a die cut doily. 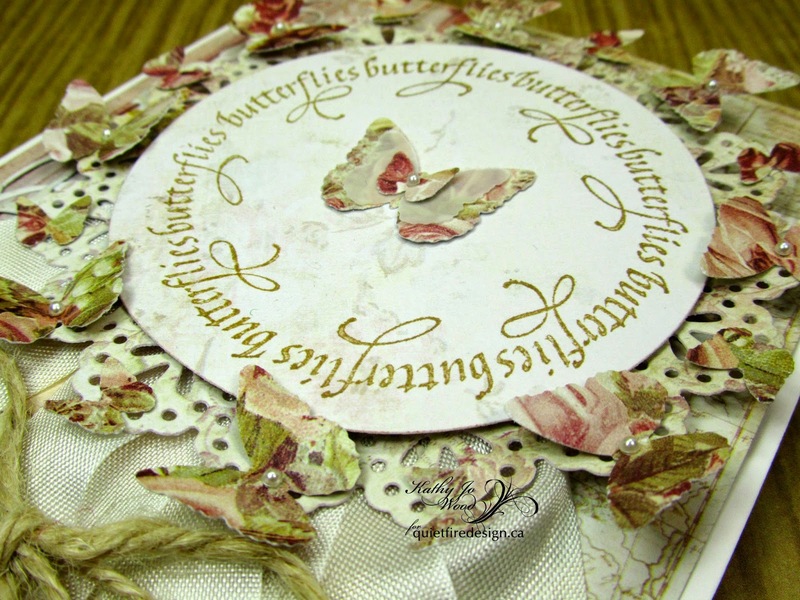 Around the doily is a circle of punched butterflies and in the middle of each of the large butterflies is a wee pearl. So pretty! 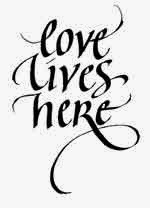 Love the swirls on the sentiment. It is if the sentiment is about to gracefully fly off the page. 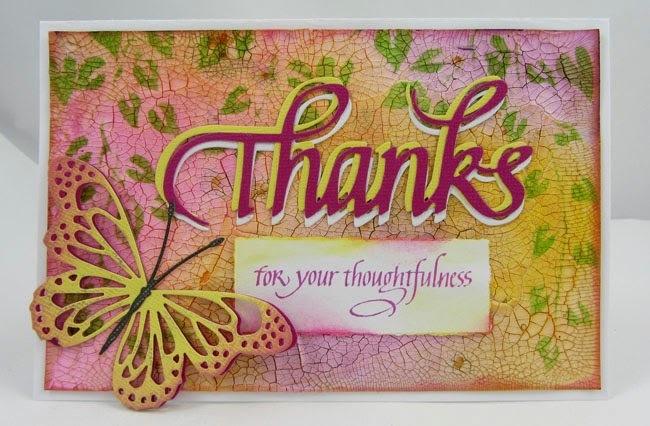 I do hope the butterfly card brought happy thoughts of spring to your day! Thanks so much for stopping by! Coming Soon! Die-ing for Spring Blog Hop! 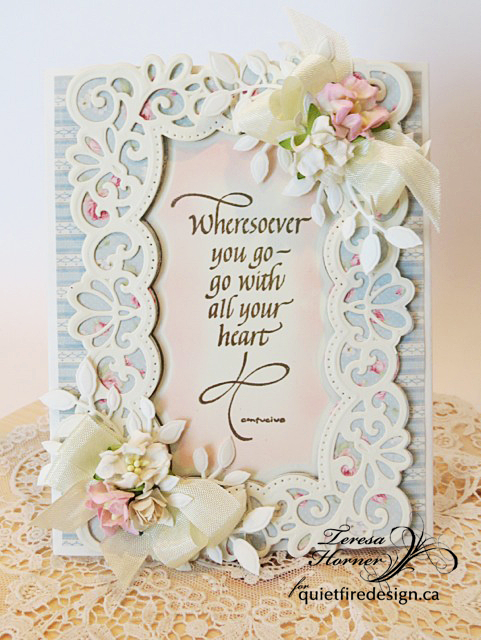 Join us beginning March 30, 2015 for our Die-ing for Spring Blog Hop when our talented designers will share creations featuring our new dies and rubber stamps. 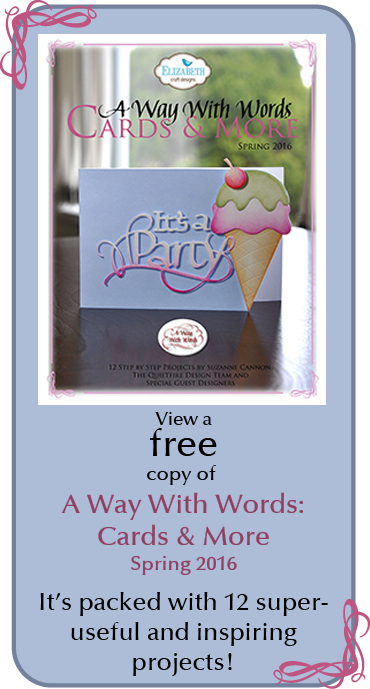 There'll be prizes, too! More details coming soon. See you soon! Designer Judi Kauffman is back as today's guest designer. 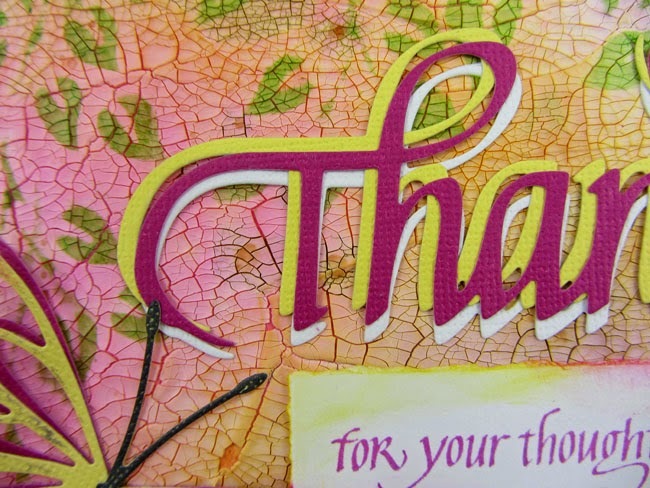 Her project is a thank you card made with our new "Thanks" die. She sewed on the star beads with pink thread, but you could use Beacon GemTac glue if you don't feel like stitching. The leaves are gold outline peel-offs on the same ink-altered Shimmer Sheetz (fussy cut along the outline), accented with Gold/Silver Glitter Dots peel-offs. 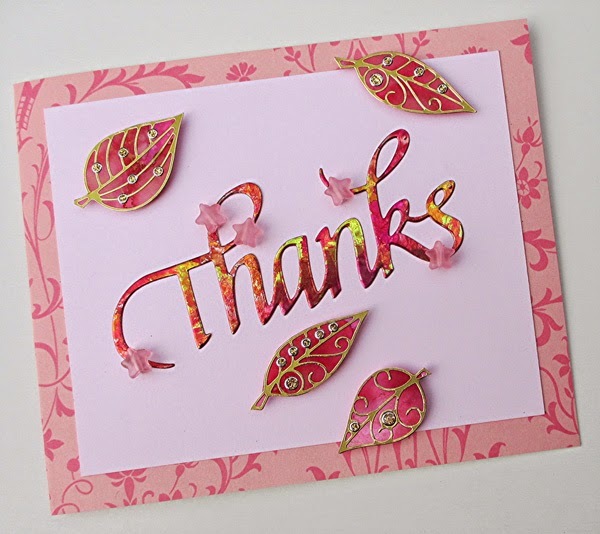 Judi used a soft pink cardstock rectangle atop an Anna Griffin patterned paper left side folded card base and foam tape to pop up the leaves. 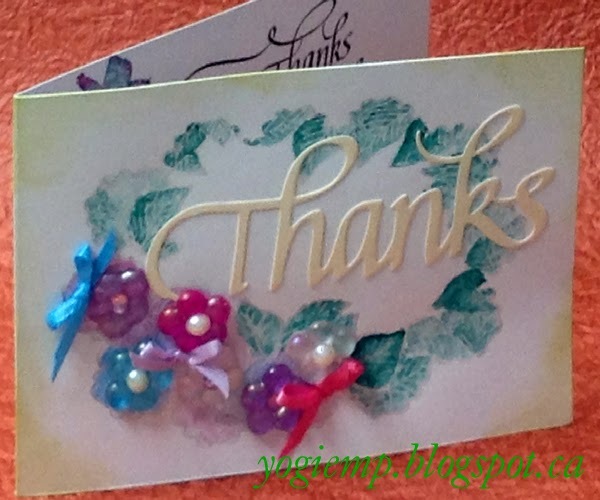 A big thanks to Judi for sharing this beautiful card and technique with us! Happy Friday Everyone, Terre Fry here with an elegant yet simply card to create using Quietfire Design stamp If I had A Star For Every Time You Made Me Smile. This card was quick and easy but it doesn't look that way. I used Anna Griffin pattern paper as well as black and white cardstock. I die cut using Spellbinders S4-475 Fleur de Elegance die template, I stamped If I had A Star For Every Time You Made Me Smile using Tsukineko Memento Tuxedo Black ink, then turned my die template over and traced the inside of the die around my stamped sentiment and hand trimmed around it. I added Want2Scrap Baby Blink Silver Rhinestones to embellish the outer die template. To secure all my pieces in place I used Beacon Adhesives Zip Dry as well as Scrapbook Adhesives by 3L foam squares. 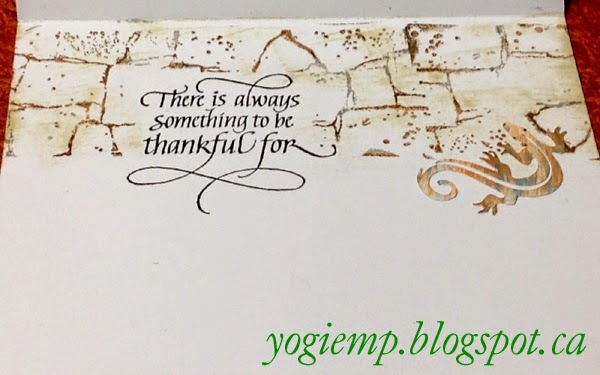 I dry embossed the thanks onto 110# white cardstock using the Spellbinders tan mat - careful, don't use too much pressure... Trimmed it down to size, then hit the high points direct to paper with Distress "Pumice Stone". Dry embossed the brickwork (Sizzix Tim's "Bricked"), only partially running it through my machine. Hit the high points again direct to paper with "Brushed Corduroy". Adhered to a blue cardstock and used my layering ruler set to trim 1/16". Wrapped some orange string around the 2 layers and then adhered to a tan cardstock. Again used the layering ruler and trimmed 1/4". 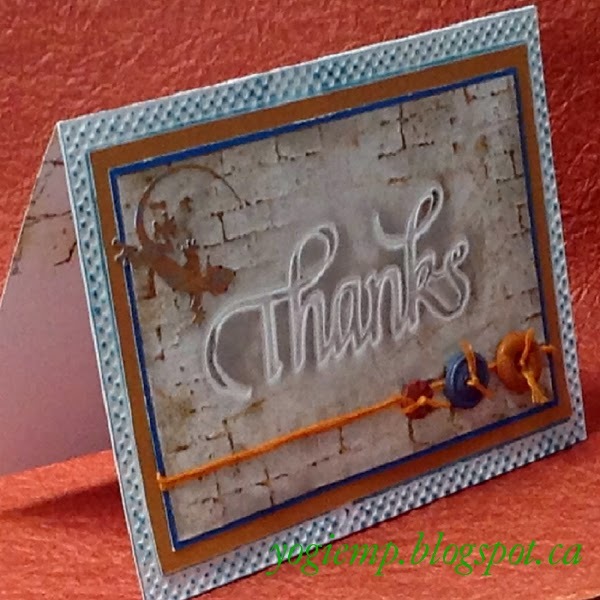 Dry embossed the checked design (Spellbinders "Gold Rectangles 1" set), hit the high points with "Broken China" then adhered my thanks layers and trimmed down then adhered all this to my white top folded card. Adhered some masculine buttons, tying them with some of the orange string then using a hot glue gun. A final touch was to add the little lizzard. An image I found on line and eCut, painted with Distress acrylics and added some black dots for eyes. On the inside stamped the quote "There is Always..." using Versafine Black Onyx and clear embossed. Cut a mask and stamped the brickwork (Kaiser Craft) inking with Distress mini pads ("Pumice Stone", then here and there with the burlap, misting with water prior stamping. Swiped "Antique Linen" over the whole design. I had cut a 2nd lizard, painted with Distress in orange and blue and adhered it. Side folded my white card. 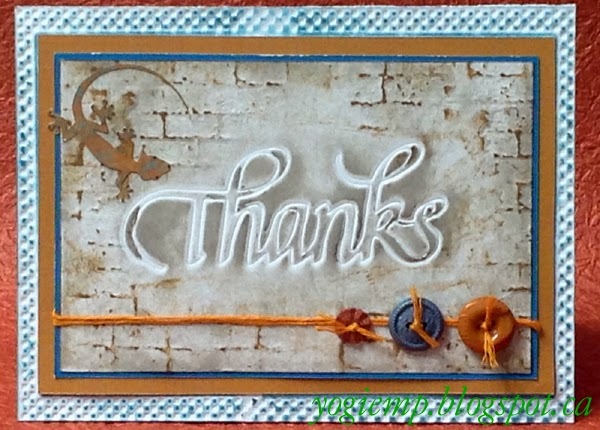 Die cut the "Thanks" from cream cardstock. Stamped the leafy frame (Creative Expressions "Cabbage Rose Frame") using distress greens, misting with water prior stamping. 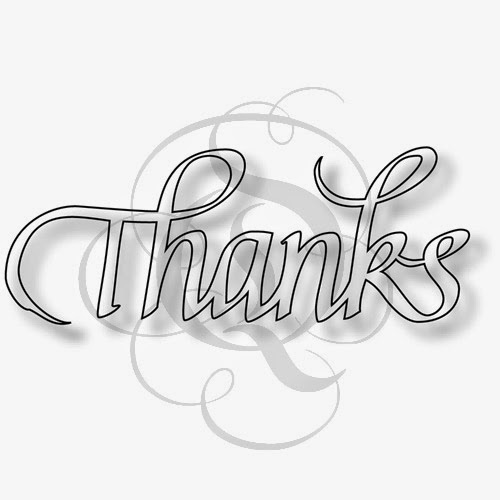 Adhered the thanks. Using Michael's plastic beads. Warm toaster oven to 300ºF. 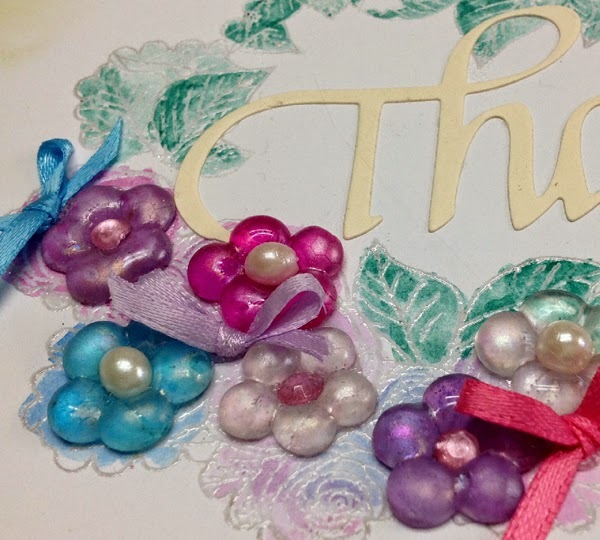 Using the tray that comes with the oven and a silpat layer (or a heat resistant craft sheet) arrange 5 beads touching each other like petals. Place in oven and allow to melt - approx 20 min. You can open the oven part way through to push the beads if they are not touching each other using a metal spatula or I used the ends of my tweezers. Put back in oven to continue. When done, remove from heat and IMMEDIATELY press a half pearl in the centers, pushing down. You'll feel some resistance which is good, probably means it's attaching itself to the inner side edges of the flower. If there is really a lot of resistance, put the beads back in the oven to warm up again. Adhere with Golden's gel medium. Tie some little bows and adhere between flowers. 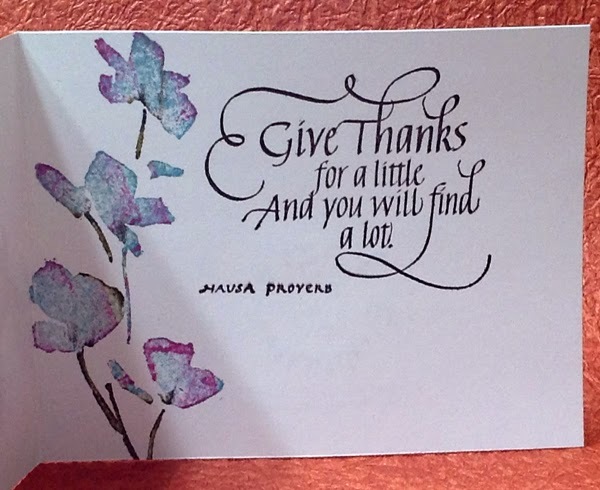 On the inside, stamped the quote "Give Thanks..." using the black. Stamp the flower (Rubbernecker "Blossom") inking stamp with Distress "Broken China" & "Seedless Preserves" & green for the stems, misting with water and stamping. Happy Wednesday!!!! 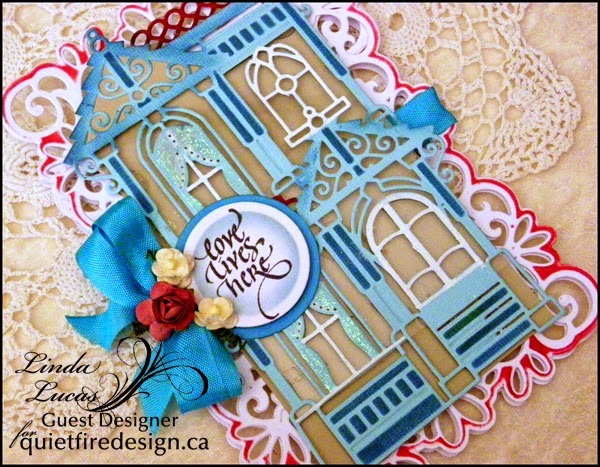 Wanda here today to share a card using the new Thanks die and a stamp from the new Thanks Cuddlers set of stamps. For the background a piece of Ranger manila cardstock was cut to 4" x 6 1/8". Color was added with Distress Inks (picked raspberries, seedless preserves. spiced marmalade) - I used the sprays but the inks or stains would work just fine. This was dried and then crackle paste was spread over the piece using a palette knife and allowed to mostly air dry. The Distress Ink bleeds up through the paste giving wonderful color as the paste dries. I did grab the heat tool a few times and hit it lightly in my desire to have it dry "now" but then tried to keep myself busy with the other parts of the card. Once the paste was completely dry I sponged on some Distress brushed corduroy, mostly around the edges, and added some drips of brushed corduroy. I decided it needed some yellow and sponged on some mustard seed. 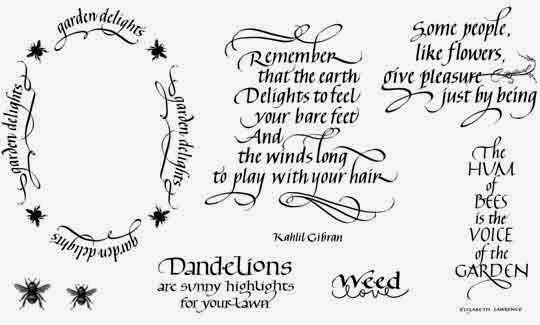 The leaves (Dylusions) are stenciled with Distress mowed lawn. And finally I added some Archival Ink magenta hue on the edges. I die cut thanks first form the magenta color of Core'dinations. It cut FABULOUSLY!!!! These are Nice!!!! Then I cut it from the yellow, then thought white might be better so cut a white one and finally, as you can see, I used all three colors together. For your thoughtfulness, was stamped onto a scrap with Archival Ink magenta hue, torn out using a straight edge to tear against, and Distress ink (mustard seed, picked raspberry) added to the piece. The butterfly (Memory Box) is cut from yellow and magenta Core'dinations. On the yellow butterfly there is magenta hue ink sponge along the outside edges and a very light brushing of Treasure Gold here and there added to catch the light as you move the card. The butterfly body/antenna are sponged with jet black Archival. 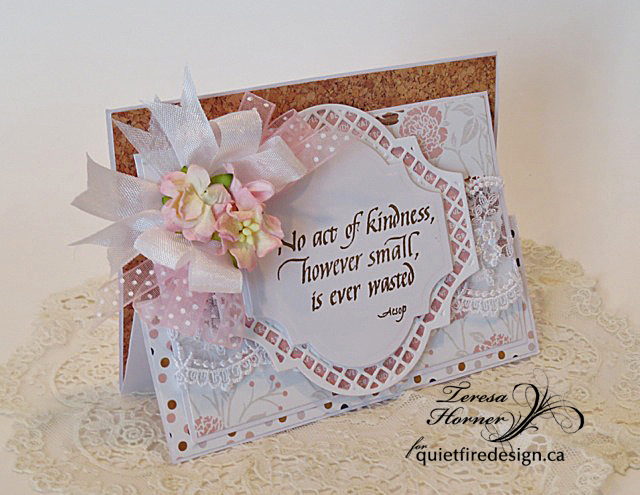 of my favorite stamps called No Act of Kindness. card can actually set it up somewhere to enjoy it for longer. Labels 41 die set and cut layers of papers and glued them on with 3D Foam dots. pretty WOC flowers from my stash. my new card and the beautiful stamp i used. 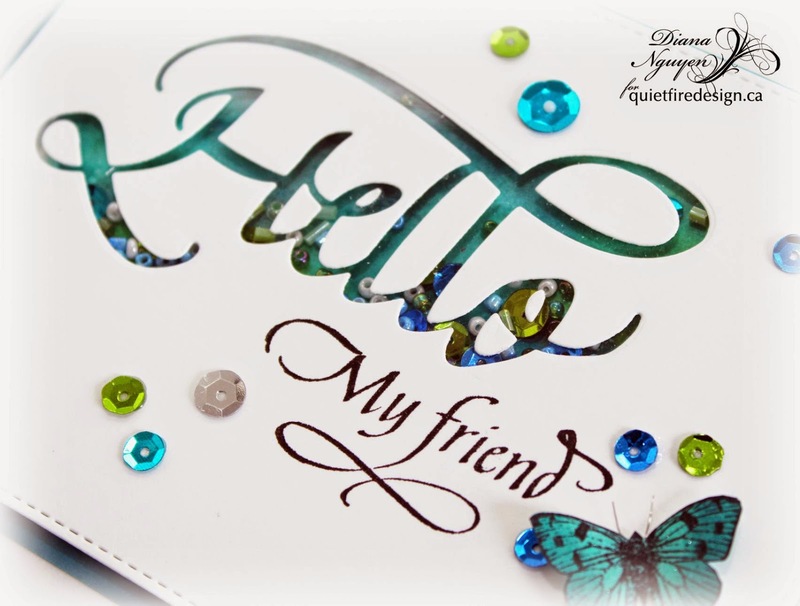 Hi, it is Linda here and I am so excited to have been invited to be a Guest Designer for Quietfire Design - I have always loved these beautiful sentiments - and the calligraphy makes them even more special. I have to say it was nearly impossible to choose the ones I was going to use - they are all fabulous! 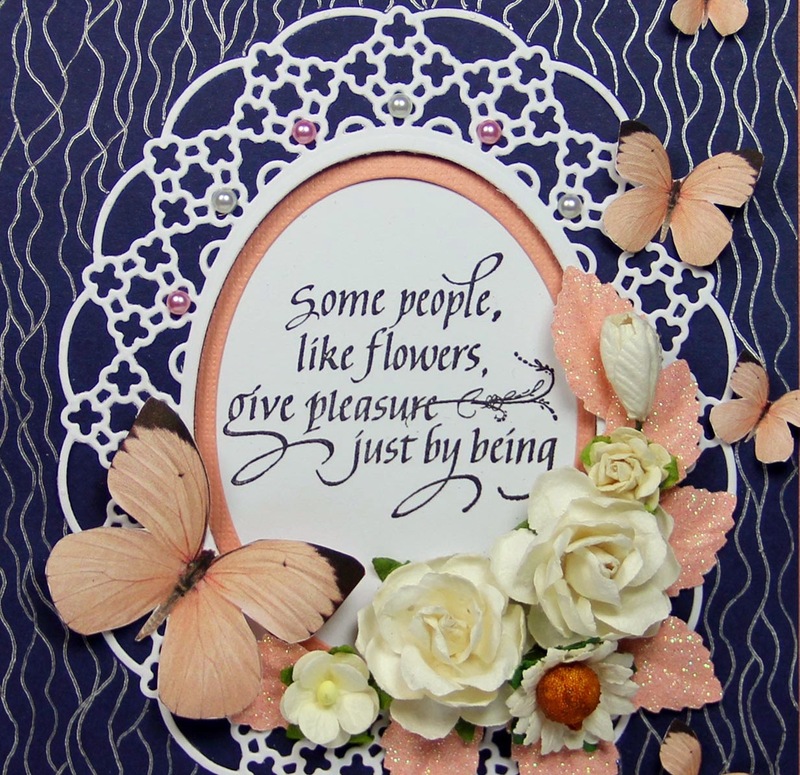 The sentiment has been stamped using Memento Tuxedo Black Ink and cut out using the Standard Circle Die, the inside of the Die has been sponged using Danube Blue Ink. This has then been layered onto a larger circle in blue, using Crafty Foam Tape for dimension. Flowers are the perfect embellishment, framing the sentiment, along with a double Seam Binding bow. 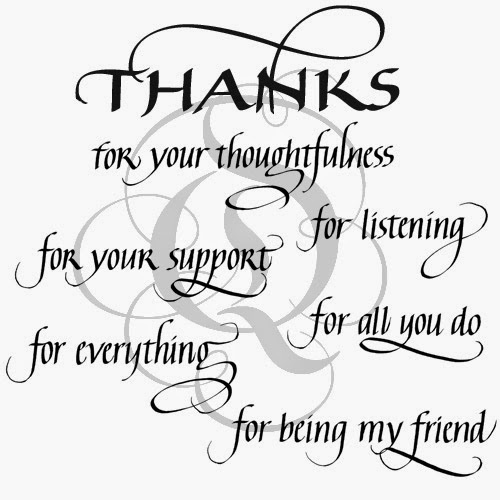 I love the way that such a small sentiment can say so much! I look forward to coming back and sharing another project with you soon. You Never Know How Strong You Are! 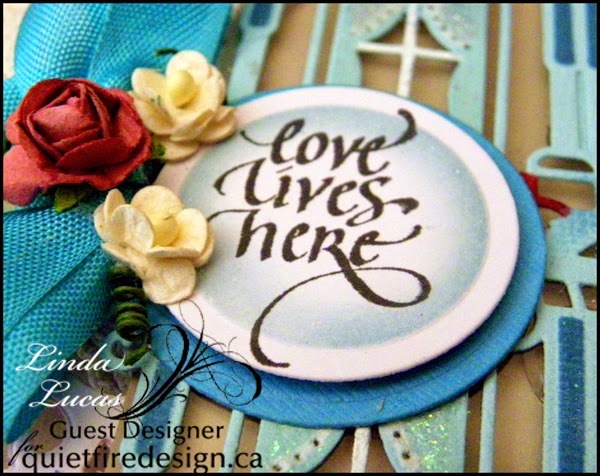 Live in the Moment tag...and a Giveaway!